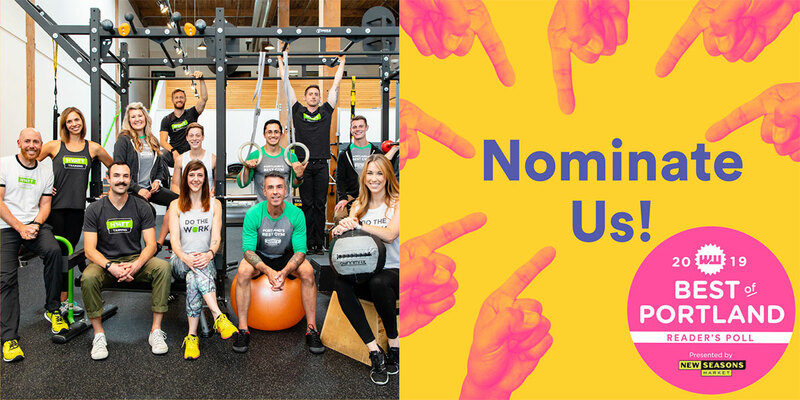 Last summer it was such an incredible honor to be voted Best Gym in Portland in the Willamette Week reader’s poll for the second year in a row. Now, we need your nomination to be on the ballot again in 2019. Please take two easy clicks to put us in the running again this year! From the bottom of our hearts, thank you for the time, effort and willingness to help out this little gym with big dreams. We appreciate it so much! At Hyatt Training, your optimal health and wellness is our #1 goal. We blend art and science to create programs that are applicable to life and sport. We bring together strength and conditioning, cardiovascular health, movement and nutrition to deliver a comprehensive lifetime health and wellness strategy made just for you. We are a collective of certified, enthusiastic and innovative independent personal trainers in Portland, Oregon. To learn more about our personal trainers or to set up a free consultation to see how they could help you, email us at Go@HyattTraining.com.